Whitehall is a historic estate in the heart of Louisville that is home to a magnificent Greek Revival mansion and 10 acres of beautifully manicured gardens. Whitehall's historic mansion is built in the classic Greek Revival style with an elegant colonnaded façade and original gasolier fixtures, and interiors designed and decorated in a Victorian style. The surrounding estate spans over 10 acres and is home to exquisitely manicured gardens that are open for the public to explore and enjoy. Built by John Marshall in circa 1855, the Whitehall Mansion began life as a modest two-story brick house constructed in the classic Italianate style, which was a popular style during the mid-19th century. The original house, which sat on 20 acres of land with a tributary of Beargrass Creek running through it, featured eight rooms, four of which were on the lower level of the house and four upstairs with a narrow and steep staircase connecting the two in the center hall. The house saw several different owners over the years, including Judge Stites, Chief Justice of the Kentucky Court of Appeals, before finally ending in the hands of successful entrepreneur John Middleton and his wife, Betty in 1909. Mrs. Middleton restored the Greek Revival mansion to its former Southern-style glory, including wings to each side of the house, the iconic front portico and columns and an elegant circular driveway in the front of the house, which is the mansion we know today as Whitehall. The next and final significant era of the mansion was in the early 1920s when the estate was purchased by Hume Logan, Sr. whose family lived in the house until 1992. The mansion and its beautiful antique Victorian furnishings, and the beautifully maintained gardens were bequeathed to the Historic Homes Foundation by Hume Logan, Sr.’s son, Hume Logan, Jr., after which it was extensively refurbished in 1994 before being opened to the public as a museum and historic site. Spanning 10 acres, the Whitehall Mansion grounds feature an arboretum, a specimen garden, a formal Florentine Garden and the Woodland Fern Garden, all of which are open for the public to explore and enjoy. The Arboretum feature a diverse collection of trees, shrubs, and flowers, including rare or uncommon species. The Specimen Garden, affectionately known as ‘Annie’s Garden,’ was established in 2001 and is tucked away at the back of the grounds. The Garden features a variety of evergreens and specimen tree set along a winding path, herbaceous plants, perennials and bulbs, and over 60 varieties of peonies that blossom in the springtime. The Specimen Garden celebrates this Victorian flower at an annual Peony Festival every year in early May. The Formal Florentine Garden at Whitehall was designed by Hume Logan, Jr. in the early 1970s and is characterized by its ornate Florentine influence with wrought iron trellises and authentic reproductions of Italian statuary from Logan’s personal collection. Neatly divided into open air ‘rooms’ bordered by hedgerows and arborvitae, the Garden is anchored by a carefully tended herbaceous border and features stunning flowering blooms from early spring through mid-October. Whitehall’s Woodland Fern Garden is a hidden treasure that features an unprecedented collection of ferns and other woodland plants from both the region and around the world, with more than 150 species and sub-species, including 30 named Victorian cultivars. The Garden also serves as what is known as a ‘stumpery,’ a Victorian garden style where tree logs and stumps are used to plant ferns and other woodland plants. Whitehall is located at 3110 Lexington Road in Louisville, and the gardens are open to the public from sunrise to sunset every day throughout the year at no charge. The Whitehall Mansion is open to the public for guided historical tours on Monday through Friday between 10: 00 am and 2:00 pm. 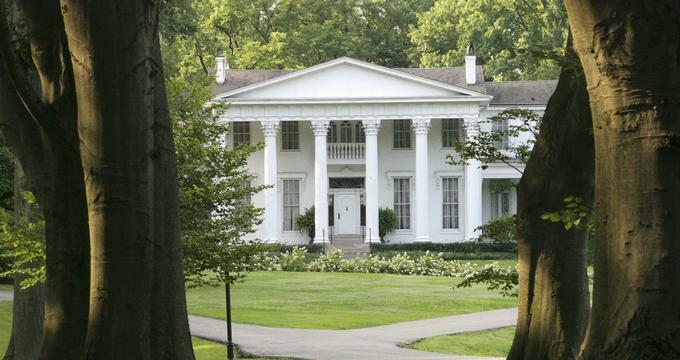 The Whitehall Gardens and Mansion are one of Louisville's most popular wedding venues with exquisite gardens and an elegant 19th century antebellum home to choose from. Whitehall hosts a variety of functions and events throughout the year, including the annual Peony Festival, Wedding Shows, Valentine’s Dinner, Yoga at Whitehall, Autumn at Whitehall, Summer Celebrations, and John Michael Carter Workshops.